Yahoo! Inc. (Nasdaq: YHOO) reported first-quarter 2014 earnings results after closing bell today (Tuesday). The digital media giant beat Wall Street's consensus forecast by $0.01 with earnings per share (EPS) of $0.38. Analysts have now underestimated Yahoo's earnings in the past five quarters straight – every quarter since Chief Executive Officer Marissa Mayer took the reins in 2012. Despite the beat, Yahoo's revenue remains stagnant, down 1% to $1.13 billion compared to the same period last year. Operating income dropped 84% to $30 million, compared to $186 million in the same quarter a year earlier. Money Morning Capital Wave Strategist Shah Gilani called the results earlier today. "I'm expecting trouble. I am not optimistic that they had any revenue gains, not optimistic that they had any profit gains, and I don't think their $1.1 billion acquisition of Tumblr is doing anything than tumbling down itself," Gilani said. One problem is the company hasn't been able to significantly monetize its recent mobile success. By the end of last year, Mayer's team managed to boost the number of unique monthly mobile users by 150 million in 14 months, up to around 400 million. As of earnings today, monthly mobile users increased to 430 million. Triumph on mobile has helped the company counteract Yahoo's lackluster revenue from the display ads and search ads divisions. But today's increased mobile user base may not be enough to fuel long-term growth. "Whatever Mayer has to do to wring profits out of Yahoo's slim bag of tricks, she had better be doing it. Monthly users will be important, most especially for their mobile component," Gilani said. "So far, Yahoo has had something like 400 million active monthly users of their mobile apps for smartphones, but don't make enough off that to even break those numbers out… that pretty much says it all for me." Meanwhile, Yahoo relies on its 24% stake in the Chinese e-commerce giant Alibaba Group Holding Ltd., which accounts for more than 50% of Yahoo stock value. Alibaba is expected to make its public debut this year, but there's still no official date set. However, that hasn't stopped analysts and investors from speculating about the size of the company's initial public offering (IPO). According to a February Reuters report, polled analysts estimated Alibaba could reach a valuation of more than $140 million – some four times the size of Yahoo itself – and is growing rapidly. That would value Yahoo's 24% stake at approximately $35 billion. While Yahoo showed little growth in its own core business today, its investment in Alibaba boosted its numbers by pulling in more than $3 billion in revenue in Q4 2013 – up 66% from the year before. "Alibaba won't play into earnings in any way other than it is the jewel in a tarnished crown. 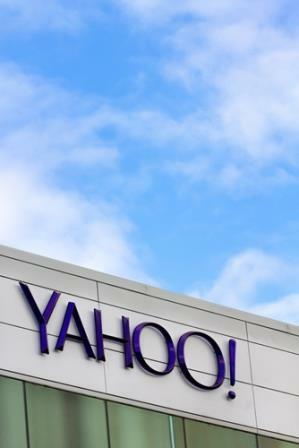 Yahoo is banking on the Alibaba IPO to boost its price, and it should get a boost in November, if that's when the IPO is launched," Gilani said. "But Alibaba is priced in and the stock will move up and down based on Alibaba's prospects." And it was likely on the wings of Alibaba's numbers that YHOO stock surged more than 8% in after-hours trading today.